When I came across a bunch of white canvases on sale at my local craft store, I piled some in my cart. I wasn’t sure what I was going to do with them, but they were such a good deal, I just couldn’t pass them up. 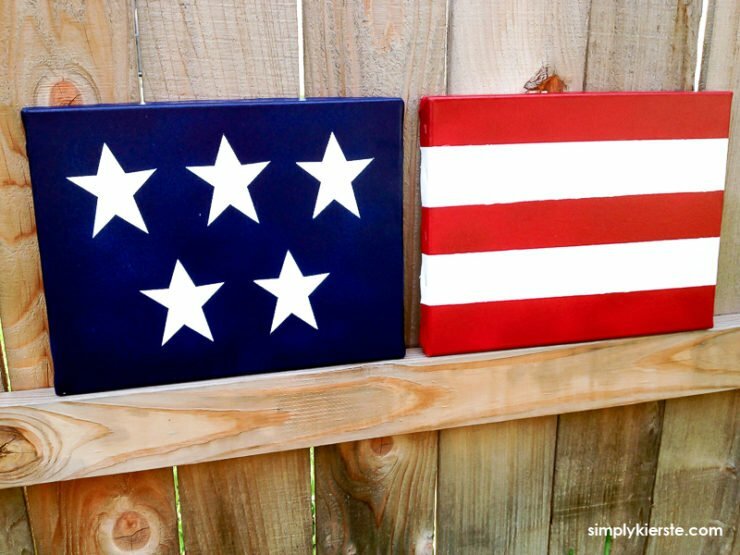 Then when it was time to pull out my patriotic decor, an idea hit me…I could make a super cute and easy canvas flag with them. And I did! I just love this project—not only is it super cute, but because it was so simple! And literally, it took less than 10 minutes to make, plus the drying time, so it’s not something that will take forever to put together. Just a few supplies, and you’re ready to go! 1. Adhere the painter’s tape ( I used 1.88 inch tape) to one of the canvases, in the width of stripes you want. You can eyeball it, or measure it out–whatever you need to get the stripes as even as possible. Make sure the tape goes around the sides, so your stripes will too. On the other canvas, add your vinyl stars. I cut mine on my Silhouette, but you could also buy vinyl and trace stars from paper stencils, then cut them out and use them! That’s it!!! SO simple, and CUTE!